Husband and wife were watching TV when wife said, “I'm tired, and it's getting late. 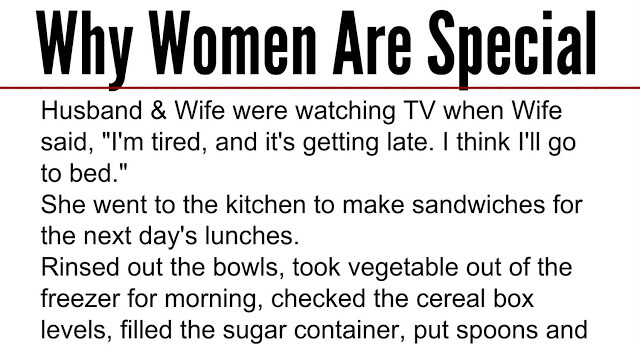 I think I'll go to bed.” She went to the kitchen to make sandwiches for the next day's lunches. Rinsed out the bowls, took vegetable out of the freezer for morning, checked the cereal box levels, filled the sugar container, put spoons and bowls on the table and started the coffee pot for brewing the next morning. She then ironed a shirt and secured a loose button. She picked up the game pieces left on the table, put the phone back on the charger and put the telephone book into the drawer. She emptied a wastebasket and hung up a towel to dry. She yawned and stretched and headed for the bedroom. She stopped by the desk and wrote a note to the teacher and pulled a text book out from hiding under the chair. She signed a birthday card for a friend, Addressed and stamped the envelope and wrote a quick note for the grocery store. She put both near her bag. Then she washed her face, put on her moisturizer, brushed her teeth…..
“I'm on my way,” she said. She put some water into the dog's dish, then made sure the doors were locked. She looked in on each of the kids and turned out their bedside lamps and radios, and had a brief conversation with one kid who is still up doing homework. In her own room, she set the alarm; laid out clothing for the next day. Husband turned off the TV and announced to no one in particular. And he did... without another thought. Share this to phenomenal women today... they'll love you for it!